There aren’t many hip-hop artists who crossover into world music, but Michael Franti and Spearhead are the exception to many rules. His ’90s albums put Franti on the map as a poetic emcee, however, not until 2001 did he take roots-rock-reggae to another level. With their game-changing album Stay Human, they developed their own hybrid of conscious pop music. Shortly after 9/11, Franti’s strong anti-war stance escalated to become one of the most powerful voices in the quest for peace. In support for their new album, The Sound of Sunshine, Michael Franti and Spearhead members Jolene Rust and Jay Bowman stopped by our studio to debut the new songs. 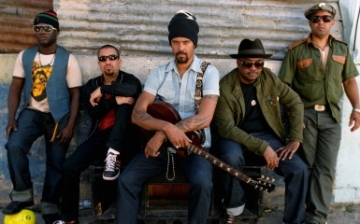 The exclusive video features an interview with Franti and live performances of the title track, “The Sound of Sunshine,” “Shake It,” and a rare acoustic version of their body-movin’ hit, “Say Hey (I Love You)” from their previous LP, All Rebel Rockers.